CMFRI Chennai Recruitment 2018-2019 Application Form for 06 Skilled Worker Posts Download Application through Official website www.cmfri.org.in. CMFRI Chennai Skilled Worker Jobs Notification 2018 Walk-in Drive Released. The Interested and Eligible Candidates are requested to Download Application through Official website CMFRI Chennai Skilled Worker Posts 2018 Walk-in Drive- Apply Now. 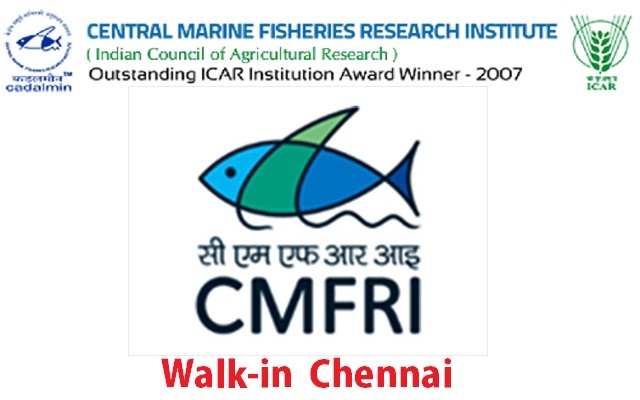 "Central Marine Fisheries Research Institute (CMFRI), Indian Council of Agricultural Research (ICAR), Mandapam Regional Centre of CMFRI, Mandapam Camp, Ramanathapuram District - 623 520."